The Scrap Exchange hosts hundreds of classes, workshops, meet-ups, and community events every year and we rely on your donations to defer the cost of supplies and equipment. Starting in 2019, we are reaching out to neighbors and friends for help in purchasing crucial items for future events and classes. Please consider donating the purchase price of an item on our wish list, or better yet, donate the item listed so we may continue to provide creative reuse educational programming for kids and adults in the triangle area and beyond! Monetary donations can be made online (see below) or in-store using the Round-Up for Reuse option at the cash register. 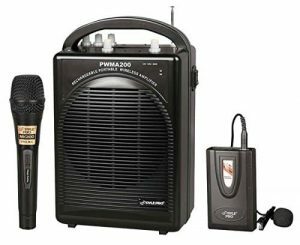 In January, our goal is to raise enough money to purchase a new portable PA system. The estimated cost is $250. Of course, we would also gratefully accept the donation of a PA system in good working order! The Scrap Exchange is a 501(c)(3) Nonprofit Organization, Federal ID Number 56-1728718.